July 28th : There is nothing more important than the Guru. There are three seemingly different elements that converge to create a divine experience in this MMS… the principles of Durga, Datta, the kannada bhajan ‘Matibodha gatidura’. The sacred Devi Mahatya – in the Markandeya Purana – narrates the story of Mahishasura, who went about unleashing terror over all the worlds. The Gods pleaded to the Trinity.. Brahma, Vishnu and Shiva to put an end to that atrocity. The trinity got very angry, and beams of light emerged from them & all the Gods. The beams converged with a bang.. to create Goddess Durga, who went on to fight Mahishasura. She is said to have paralysed the demon with a flash of extreme light emitting from her body, and then killed him. This MMS begins with such flashes of light that created the Goddess Durga who dispelled darkness symbolic of evil. Well, the word Guru means ‘one who dispels darkness’. And our Gurudeva who dispels the darkness in our lives is certainly Devi Swaroopa. Now, let’s synthesize the above perspectives, to get the full import of today’s message. Imagine yourself walking alone through a dense forest. Can you think of anything more important to you at that time, than a stick that can give you support ? Imagine you are a plant that is drying up for want of water. Can you think of anything more important to you at that time, than a few drops of water or rain ? Metaphorically, that is how you will feel when darkness in your consciousness prevents you from seeing the divinity within. At that time, what can be more important than the one that can brighten your consciousness ? Nothing. Yes.. There is nothing more important than the Guru. A millions pranams at the holy feet of our revered Gurudeva who is Devi Swaroopa and Datta Swaroopa, for brightening our inner self with such a divine MMS experience! JGD ! Your Puttuji. సద్గురు గణపతి సచ్చిదానంద స్వామిజి పాద పద్మములకు కోటి ప్రణామములు. గురు గీత సారాన్నంతటిని ఈ ఒక్క MMS ద్వారా మనందరకూ తెలియ పరచారు సద్గురువులు. Jaya Guru Hanuman, Amazing opening sequence. I felt when two rays are meeting it is like Jivatma meeting paramatma and eventual bliss. The ray coming from up is Paramatma in the form of Guru who descends to our level. The other ray represents Jivatma or us who are lost in the begining but after having guru darshan follow the footsteps of guru. The ray going up also tells that our sincere effort is needed in following the Guru to receive the grace of Guru and eventually realize God. Guru is like a navigaor i.e. GPS who can show us the correct path to realize God, to know who we are, to purify our minds, to cleanse our bad karma by making us do good karma. In this video two principles of Guru are shown – the mother principle (Durga) and the father principle (Datta). As a mother Guru showers unconditional love, bears our mistakes and as ‘Kripasindhum’ forgives us and patiently helps us thread the correct path. As a father Guru sometimes scolds us, makes us go through certain experiences and as a goldsmith turns us into gold by hammering out all the impurities. Humble prostrations to the lotus feet of Sri Swamiji who is the universal mother and father. Jaya Guru Datta, Appaji! The Devi Mahatmaya is such a treasure! It is always a reminder to me that the divine mother, our Guru, is there to help us fight all the demons in our mind. She is our champion in the internal struggle. She kills passion and anger, self-conceit and self-deprecation, one who pretends to be a friend and so many other demons that we face and hold inside us. As Guru and Mother, may your light remove darkness from all of our minds and destroy those bad qualities in us all with which we struggle…It is no accident that our ashram is at the foot of Chamundi Hill! Datta and Devi together in physical form there to bless us and heal us…This is such a beautiful video….Jai Durga, Jai Datta, Jai Hanuman! Guru concept is central to our Sanatana Dharama. It is the pillar on which the entire Hindu edifice is built. All Hindus must protect by clear understanding of the role, value, significance and importance of Guru Tattva. It is essential that every human being develop faith in Guru concept and reap the benefits. All the Gods had guru, all the Gurus had their gurus. Debate as to whether we need guru or not is futile. Let us pray that all human beings are given enough wisdom to embrace the guru concept, become a devotee of a guru and reap the untold benefits. Universe created from God energy called Aadi Shakthi. Very nicely posturized the video. Universe will be controlled by Trinity( Brahma, Vishnu and Shiva). Guru is Trimurthi avatara so nothing is more than Sadguru. Very nicely shown how Guru show light to world like Sun. Sadguru is angry no one can save us. Nothing is more important than Guru. Wow! Song with very deeper meaning and the revolving background of the universe and cosmos just transports us to a divine dimension. The video clippet impacts on us in such a way the we starts focusing inward andvthe contemplation begins within us. Beautiful and very effective video. JGD, thanks and humble pranams Pujya Sadgurudeva. ” guruvina gulamanaguva tanaka doreyadanna mukuti”!. We have been blessed with Guru’s presence in our lives and we should appreciate it and act accordingly. Just thinking to my own life, without Appaji I would not be the person I am today. I shudder to think of the shell of a human I would’ve been. I am thankful for Appaji always. Jaya Guru Datta. Also this video is cosmic with the artistic expression and Appajis voice. Our Sadguru is the alchemist who takes us the base metals and transforms us into gold. He is always looking after us in this life and will continue to do so in future wherever we may be. His love and compassion is greater than any normal human is capable of, thus even our parents cannot give us what Sadguru gives. As disciples of Appaji we are so extremely blessed. May we always strive to be worthy of our beloved sadguru. Om namo sadguruve namah. Om namo Hanumate namah. Just beautiful. This message is amazing that Poojya Sri Swamiji is conveying a message that I can feel but can’t express it & yet Appaji does it in less than two miniuites. Many many pranams to the holy feet of Sadgurudeva. Om Dram Dattaye Namaha! What I would do without my Guru? Who or what would give me orientation? I can’t imagine my life without Swamiji. All what I do is in some wise bounded with Him. I ask him always when I need answers. I feel and hear Him always in me. Yes, my guru is the most important in my life!!! “GU bedeutet Dunkelheit. RU bedeutet Licht. Worte, die ausdrücken wie sehr ich Dir danken können möche, allerinnigst geliebter Sadgurudeva! Deva di Deva! S.G.D.! SRI GURU MATHA! sri sri sri ganapathi sachchiananda swamiji,appaji,guruji.Many devotees call you in their own style.But you have always responded as a guru with lots of love.I have achieved stability on mind of things that had gone out of control and things under my control.It is all because of your rememberence every day.And your preaching. Most deeply touched in my heart. Na Guroradhikam Na Guroradhikam Na Guroradhikam Naguroradhikam, Siva Sasanatha Siva sasanatha Siva sasanatha!! so says Guru Gita. The grphics in this video have captured the lyrics of this bhajans with perfection. Superb MMS. For me, the concept of Guru was alien and my ego always stopped me from bowing down to Appaji and this was me inspite of the fact that I come from a family who is now into third generation of serving Appaji. Today, after infinite miracles, abundant grace, unending forgiveness and priceless love and affection from Appaji, I cannot possibly state the meaning nor can I describe the truth of this MMS in my own life. Raja Rajeshwari’s picture that materializes when two forces collide, the imagery that follows it with Dattatreya in the foreground, the flower getting drenced in water, the closing of this MMS with orange rose, everything graphically represents the bhajan. The bhajan itself has taken me into a trance mode. I haven’t heard it before, but now after listening to it with closed eyes, I have had tears in my eyes because of those lyrics. They perfectly describe Guru’s place in our lives. Thanks Puttuji for letting us know the album name. Million pranams and one silent prayer to Appaji to thank HIM for my existence. I know for myself how much HE has molded me that today I feel worthy to even state what He means to me on a public forum. Thanks APpaji, I know you are listening 🙂 JGD!! JGD Puttuji!! Felt like saying this in reply to this MMS and your interpretation. I am the wavering mind, who needs your hands to withhold. I am the imperfect heart, who needs refuge in your perfection. Your subtle visual clues are my most prized possessions. You taught me love and compassion and solved my inner fight. Together with you, I have discovered unknown melodies. With you by my side, life is a sweet journey. Following your path with complete surrender is the safest bet. In your warm embrace, all my troubles are offset. Blessing me more than I expected in your undeniable style. In real and in dream, you help me travel into your space and land. For all the love and blessing you shower upon me in abundance. JGD. So nice message with good song. I really like this song Thataji. Eine universelle Weisheit und Tatsache, überall gültig, egal aus welchem Blickwinkel betrachtet. Die Botschaft ist umgesetzt mit einer wunderbaren Bildwelt und die Musik unterstreicht sie auch nochmal wie ein uns darauf ausrichtender Weckruf. Wir können heilfroh sein, dass wir bei unserem geliebten Sadguru Sri Swamiji sind. Vielen Dank für Deine Anwesenheit. A universal wisdom and fact valid everywhere, no matter viewed from any angle. The message is converted with a wonderful image world and the music also underscores the message again as a forward-aligned wake-up call. We can be glad that we are with our beloved Sadguru Sri Swamiji. Once when I was in Ashrama Appaji said: “when Brahma is angry with you , you can go to Shiva, when Shiva is angry with you, you can go to Vishnu, but when Guru is angry with you — finished, with this I realized the all importance of Guru, nothing is superior to Guru. Prostrations to my Guru. The concept of Guru-Shisya is there for ages in Hinduism and holds very high respect for Guru, but in this modern world i feel the word Guru is lightly used. The literal meaning of GuRu is the one who dispels darkness… it is very important that once we are with a Guru, it is a life long relationship for not only this birth but also for all future births. It is not easy to comprehend Guru’s action, one must totally surrender at the Lotus Feet of Gurudeva to truly understand Guru tattva. The aim of this life is to understand Guru tattva and follow his foot steps. My Humble Pranams to the Lotus Feet of our Beloved Guru Deva Sri Swamji for giving us daily lessons through SGS MMS videos and also giving superb explanation about the video. It is like peeling the banana and putting before our mouth, only thing we have to do is to eat. Pujya Guru Deva is the only Guru, who can make such things happen. Never I will forget the day in my life when I met Swamiji the first time! We were a small group of people gathering in a simple wood house in Switzerland. Everybody was waiting for Swamiji to come and sing bhajans. I did not know what to expect but I was a curious teenager interested enough to come along with my aunt and meet the holy indian man. A few seconds just before Swamiji entered the room I felt like the world would stop turning and the time would simply stand still – completely. Time and space where just gone! Swamiji then suddenly appeard and my heart was opening wide – a feeling I never had before. Tears were running and I had the instant and strong believe “I know YOU” and “I belong to YOU”. Swamiji is my father and mother – and I am His child. NOTHING ELSE MATTERS – my soul would be without LIFE without SADGURU! It is very hard to get Guru in ones life,but once we get our Guru in our life we are the most blessed and luckiest person than anyone it is my personal experience.Then we will know that Nothing is more important than the Guru. This MMS is beautifully presented by our beloved Guru Appaji.pranamams to Sri Guru Deva Datta.Sri Swamiji has filled his energy in the entire universe. It is Guru’s Blessing showered on disciples. Guru brahma Guru Vishnu Guru devo Maheswarah. I am born in the West and there the habit to have a Guru a little strang. After seeing Swami Ji the opposite is through. Seeing his video you becomes uplifted and a prana kind of joy you can feel. I am happy to experience the video. The MMS is very impressive. 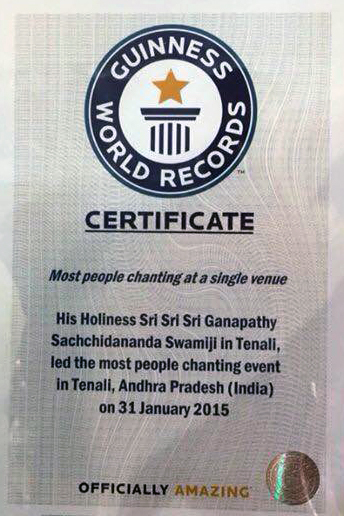 It shows that the bright illumination through Sri Swamiji is shining all over the world. He is shining in the hearts of His disciples. Lord Dattatreya is everywhere at the same time. There is nothing more auspicious, more caring, more loving, more virtuous, more knowledgeable, more benevolent, more compassionate, more musical, more impressive, more interesting, more touching, more present, more helping, more persistent, more inventive, more didactic, more patient, and again more patient than the Guru. How can anything or anybody be more important than the Guru? Koti Koti pranams to the Divine Lotus Feet of Sadgurudeva Sri Sri Sri Pujya Ganapati Sachchidananda Swamiji! When I started to follow my thoughts after seeing the video and the message, to write a comment, so many things started coming into my mind which I wanted to express. It kept going on and finally I felt it ending up in ‘silence’. I giving importance to someone or something comes into fact after the so called I exists. When my existence itself is blessing of Guru, how else can I express the importance of Sadguru. Gurur brahma Gurur Vishnu Gurur devo Maheshvaraha, Gurur Sakshaat Parambrahma Thasmai Sri Guruve Namaha. Pranams to the Lotus Feet of Sadguru Deva. Jaya Guru Datta Appaji, you are our Guru and God. Bless us Appaji. Sadguru Devo Bhava. Om Namo Hanumate Namah- Sri Gurubhyo Namah. The visuals with the bhajan is mesmerizing. From my personal experiences I can relate to today’s message that there is nothing more important than the Guru. I have grown (personally and professionally) a lot with Sri. Swamiji (Appaji’s) Grace. I am not sure where I would be if I had not the blessed opportunity to have darshan of Appaji for the first time in the Year 1997 in Jesus Datta Retreat Center. Now Appaji is also helping me and my wife bring our kids with due care in the US. Just the feeling that I can face the day’s challanges because I know Appaji will help me if priceless. Thank you Appaji. Sree Guru Datta. Guru is the Light that throws brightness into my Life.Guru is the light that shows the path that I tread. Thanks to the technical team for this effort in putting this video in a very nice form. I pray Sri Swamiji to help remove my inner ego and make me realize the importance of guru. Two beams of light coming together. Guru is always shining in our hearts. Yes Appaji in our life nothing is importent than u and you are everything for us. What a wonderful video. What an energetic music, that I also found on my iPod. It makes me very happy, and connected with my Guru. Thank you very much, Swamiji. Jaya Guru Datta, Appaji, my heart is very happy to read all of these loving and grateful comments about our most beloved SadGuru. I remember the time before I meet Swamiji. I had no Guru, still I was trying to develop, to improve as human being, cultivate the good qualities in me and reduce the less good. Eventually I realized that I needed Guidance from a Guru, at that time I did not realize how important a Guru is. Looking back I know it meant everything – and still does! Thank You Swamiji, for letting me come home. JGD. Guru is the embodiment of every thing a person desires to reach the truth. Guru is simple in nature like a child, at the same time like a mother who scolds and corrects when her child does some thing wrong, like a father who advises and teaches the moral, and who is short and simple in speech and gives that beautiful smile which instantly removes our sorrow and lifts our mood to an unbelievable level. I do not think so many words are required to define Guru, a simple Sri Ganapathi Sachchidananda Swamiji is enough. The animation of, ‘Om Dram Dattaya Namah,” was absolutely splendid. The blue colour writing made us wonder, what these figures are?? Our Guru is Our world. This video is very powerful. We pay obescience to Our Sadguru, who is Vishnu who rules over all, who rules over time. He protects the world from the cycle of time by becoming Durga Maa, but, He is Datta, He is Vishnu. Feel like finding out the meaning of the song, “Gati Bodha Mati Dura” & also learning how to sing it. A beautiful & powerful bhajan indeed. Jaya Guru Datta This video and rithmic bhajan makes us very aware of the importants of Guru and shows very nicely how the light dispels the darkness.Thank you very much Gurudev. I am reminded of the verse in Guru Gita – Guru Madhye Sthitham Vishwam, Vishwa Madhye Stitho Guru, Vishwaroopa Viruposau Tasmaye Shri Gurave Namaha. This sums up for me the MMS of our Sadgurudeva who is visually presenting us with the messages and the background music that takes us to a world which is so divine and full of bliss. Appaji, please help me to understand this message more and more, deeper and deeper. Relationships, be it familial or social are specific to a birth. But the relationship with Guru is one than spans across numerous births. It is that bonding developed over several births that makes a devotee hold onto his Guru, in happiness and in sorrow for it is his Guru and not family or friends who will continue to be with him and will follow him to the next birth as well! In fact, Saint Kabir Das is known to have said that if God and Guru were to be brought in front of him, he would bow to his Guru, for it is the Guru who has shown him God! Such is the greatness of Guru. However, not all souls are blessed with the association of a Guru, not everyone has tasted the nectarine friendship of Guru. We are blessed souls to have Sri Ganapathi Sachchidananda Swamiji in our age, who has accepted us as His disciples. We must always bear in mind the significance of Sri Swamiji in our lives. This video, reverberating with Sri Swamiji’s sonorous voice and His words, reminding us of what is of utmost importance to us is one of the best. Knowing the importance of Guru and having the fortune of being associated with our Sadguru, we must follow Sri Swamiji, learn His ways and thank our good fortune for we are being protected by Lord Dattatreya Himself! Jaya Guru Datta! A beautiful video inspiring devotion towards Guru! A highly (Guru) philosophical bhajan…again inspiring a devotee to follow Sadguru! Each one of these MMS messages is a potent pill to eradicate Ajana in us and walk towards liberation. Thank you, Appaji for this beautiful episode. Sri Guru Datta. Als ob die Buchstaben diese Botschaft auf verschiedenste Weise aufzeigen wollten, drehen und wenden sie sich. Und ich komme durch die pulsierende Stimme von APPAJI in eine neue Dimension dieses Wissens und erlebe die Aussage von JESUS „ich bin der Weg“ auf wundersame Weise neu. Danke mein GURU, dass DU mir mit unendlicher Geduld immer weiterhilfst auf dem Pfad.